إذا كنت تبحث عن فندق بموقع جيد في خليج بريون، فقد وجدت ضالتك في Baystay Bed & Breakfast . يقع مركز المدينة على بعد 1.0 km فقط. ويمكن الوصول إلى المطار خلال 45 دقيقة. يشكل هذا الفندق ملاذاَ مريحاً للاسترخاء ويمنح زواره فرصة للاستجمام والتجدد، وهو يقع على بعد خطوات من المعالم السياحية الكثيرة للمدينة كمثل: كابي بايرون, Tiny People, ‪Lone Goat Gallery‬. يقدم Baystay Bed & Breakfast خدمات لا غبار عليها وكل أشكال اللياقة وحسن الضيافة اللازمة لإسعاد ضيوفه. يقدم هذا الفندق العديد من الخدمات الكفيلة بإرضاء أكثر الضيوف تطلباً. ادخل إلى واحدة من الغرف 5 وتخلص من عناء نهار طويل بمساعدة مجموعة كبيرة من الخدمات كمثل تلفزيون بشاشة مسطحة, اتصال لاسلكي بشبكة الإنترنت (مجاني), حوض الاسترخاء, غرف لغير المدخنين, مكيف هواء الموجودة في بعض الغرف. صممت خدمات الاستجمام في الفندق والتي تتضمن تدليك, حديقة لمساعدتك على الاسترخاء والراحة. مهما كانت دواعي سفرك فإن Baystay Bed & Breakfast هو خيار ممتاز لإقامتك في خليج بريون. We got there 14:30 for check in. There was nobody at the premises. Went for a wonder and came back around 4 pm. A lady finally let us in and showed us the cabin. What a disappointment!!!! Carpet in the room stinks. Pillows on the bed as flat as a 5 dollar note. Old bathroom with the most disappointing shower we've ever seen. Baby cockroaches pretty much everywhere in the poorly contained kitchenette and bathroom areas. We wouldn't recommend this place to anyone. Waste of money. Stay away. All that you get is a stinky room and no breakfast. What a disappointment!!!! Excellent spa and sauna, great staff and lovely surroundings. The room was very n ice and in a nice setting. Breakfast is with the family home and was a little awkward for us. But I'd recommend this place anyway, for closeness to the beach, comfortable bed proximity to the city and it's world class restaurants. the rooms are pretty basic, but large and have a/c. we had a little terrace, breakfast was nice and the hosts were lovely. pretty close to the beach too. overall good value. Very nice couple and good room. Good advice and close to everything. 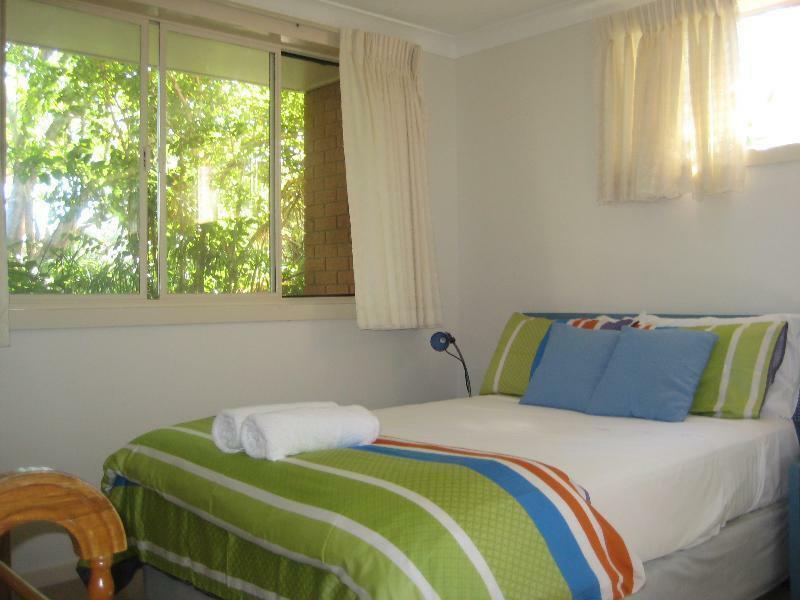 If you're surfing and want to be close to the beaches and get home to somewhere quiet this is for you! 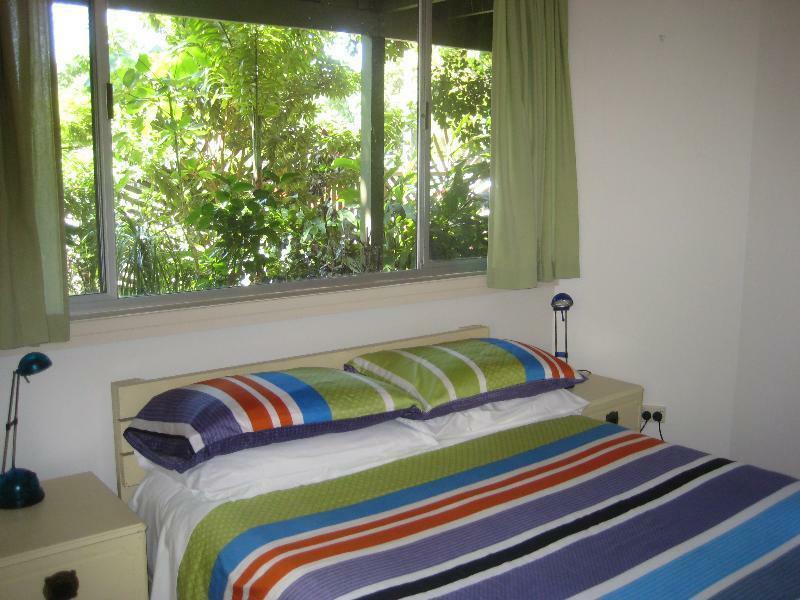 Quiet, self contained, close to beach and town centre. I really want to say terrible things here so no one else books this place! It was absolutely wonderful. The studio is self contained and separate to the main house. 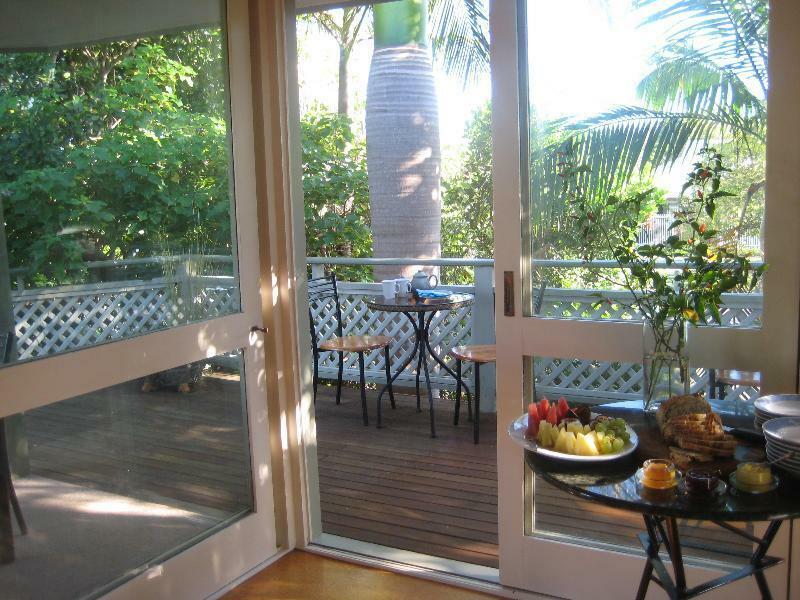 The front veranda, with its table and chairs and sun bed, is lovely to relax on. The gardens are wonderful, making the studio very private and you feel like you are in a cool tropical paradise. The studio itself was clean and very confortable. The little kitchenette fully equipt for making snacks or light meals, even mosquito coils! The location of this B&B could not be better in my opinion, it is close to the beach (5 mins sedate walk east), but also very close to the centre of town (5 mins sedate walk north). In saying this you are just the other side of a park so there is no noise and its very relaxing, you get the best of both worlds in Byron. Breakfast was delicious and served on the shady verranda. Annie and Jack (running the B&B for the past year while the owners are away) were fantastic hosts and very helpful. I will be booking this place again! !